I upgraded from Linux 3.8 to 3.11 among with newer Mesa, X.Org and Intel driver recently and I found a small workaround was needed because of upstream changes. 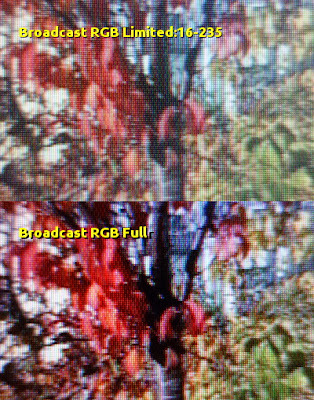 The upstream change was the Add "Automatic" mode for "Broadcast RGB" property, and defaulting to the Automatic. This is a sensible default, since many (most?) TVs default to the more limited 16-235, and continuing to default to Full from the driver side would mean wrong colors on the TV. I've set my screen to support the full 0-255 range available to not cut the amount of available shades of colors down. Unfortunately it seems the Automatic setting does not work for my HDMI input, ie blacks become grey since the driver still outputs the more limited range. Maybe there could be something to improve on the driver side, but I'd guess it's more about my 2008 Sony TV actually having a mode that the standard suggests limited range for. I remember the TV did default to limited range, so maybe the EDID data from TV does not change when setting the RGB range to Full. I hope the Automatic setting works to offer full range on newer screens and the modes they have, but that's probably up to the manufacturers and standards. Below is an illustration of the correct setting on my Haswell CPU. 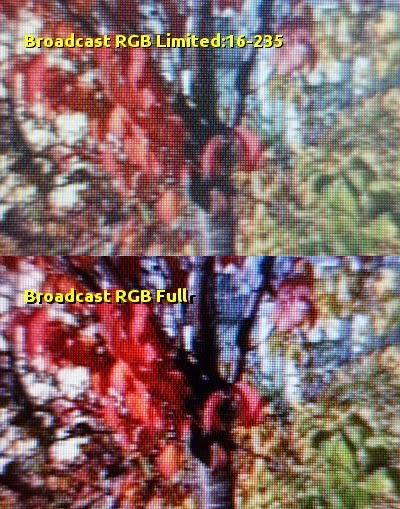 When the Broadcast RGB is left to its default Automatic setting, the above image is displayed. When set to Full, the image below with deeper blacks is seen instead. I used manual settings on my camera so it's the same exposure. /usr/bin/xrandr --output HDMI3 --set "Broadcast RGB" "Full"
Important: when using the LightDM setting, enable executable bits (chmod +x) to /etc/X11/Xsession.d/95fullrgb for it to work. Obviously also check your output, for me it was HDMI3. If there is no situation where it'd set back to "Limited 16:235" setting on its own, the display manager script should be enough and having it in /etc/X11/Xsession.d is redundant and slows login time down. I think for me it maybe went from 2 seconds to 3 seconds since executing xrandr query is not cheap. Note that unrelated to Full range usage, the Limited range at the moment behaves incorrectly on Haswell until the patch in bug #71769 is accepted. That means, the blacks are grey in Limited mode even if the screen is also set to Limited.